Serve ice cream, sherbert, mousse or even appetizers in the Winco SD-5 Sherbet Dish 5 oz. This shiny dessert dish features a mirror-polish finish that creates a festive look. 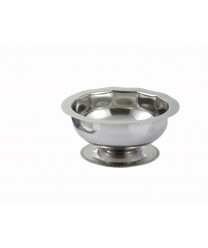 Made of stainless steel with a paneled design, this dessert dish has a footed base which enables it to rest securely on the table. It is bound to match any decor and make any dessert look appetizing and exotic.